Committed To Error Free Performance. When it comes to protecting your kitchen equipment from fire… ANSUL® products protect more food service kitchens than any other brand. Make sure you’re prepared for those critical first two minutes of a fire. 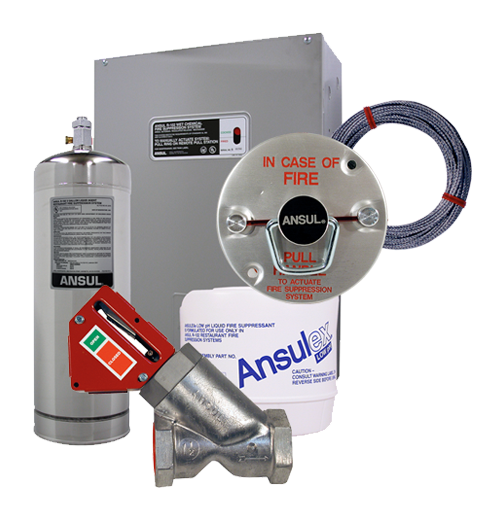 Choose from a complete line of ANSUL portable fire extinguishers to protect your people and property. Welcome To Automatic Fire Control. We are a modern company with old fashioned values. Our continuing education keeps us abreast of new fire and safety methods and techniques. All of our servicemen are Ansul trained and certified. We respond 24 hours a day, 7 days a week. We are ever aware that down time in a restaurant or business is a losing situation. We provide the expertise to survey, analyze and provide the right solution for your fire protection needs. Our goal is to achieve a long term working relationship with the people and businesses we service. We are very competitive in pricing our products; and we will only sell what we consider the best. We don’t take shortcuts. We have the equipment and products to do the job right. Customer satisfaction is always guaranteed. All equipment installations will meet or exceed all city, state, and insurance requirements. All installations and service follow NFPA guidelines. We stand behind our products and services.